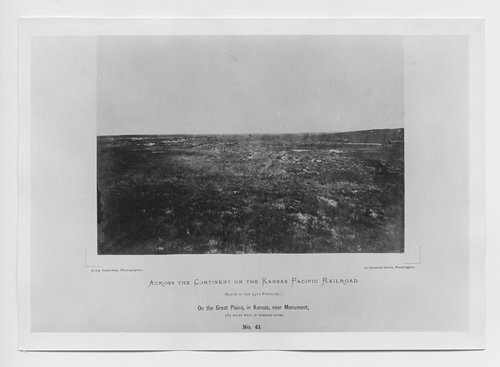 This photograph shows the Kansas plains near Monument, Kansas. It was taken 385 miles west of the Missouri River on the route of the 35th parallel. Monument was first established in 1865 as a stage station in Gove County and later became a military post. The troops and post office were moved 35 miles northwest on June 24, 1868, to a site in Wallace County (now Logan County). Alexander Gardner photographed the Union Pacific Railway, Eastern Division, as it was being built across Kansas. Along the route he documented towns, forts, rivers, wildlife, plants, and landscape. This image is part of a series titled Across the Continent on the Kansas Pacific Railroad.